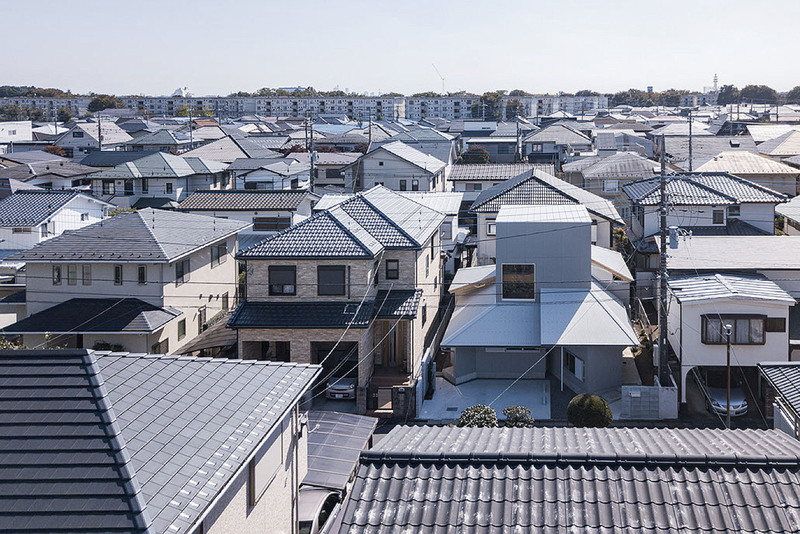 Forty years after land lots in this area were first sold in this commuter residential town outside of Tokyo, the number of old couples and single-person households are on the rise. At the same time, there are families in this area who are converting their homes to multi-family dwellings. It's a quintessential example of a former "new town (residential development projects of 1960s and '70s)" where multi-family households seeking to maximize floor space intermingle with elderly residents who have too much unused space. 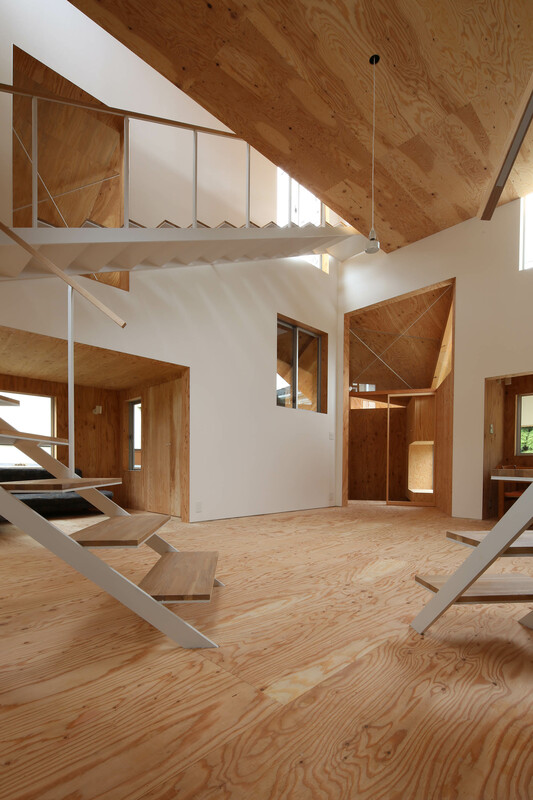 As a result of the off-the-shelf layouts at the time, vernacular houses having smaller second floors and geya (attached space with roof protruding from the exterior of the main building) had inadvertently created bright gardens and a rich layering of trees. Residents have come to socialize over walls and hedges on the narrow berms that separate the gar dens and houses. Although the environment and community of the neighborhood have matured over time, standardized designs from the past are no longer serving the life styles of newcomers to the area, as well as those of the long-time residents who are moving onto new life stages. This site faces the street on its northern side; the parking and approach, southern backyard, and a narrow berm that connect these are squeezed into a small space. 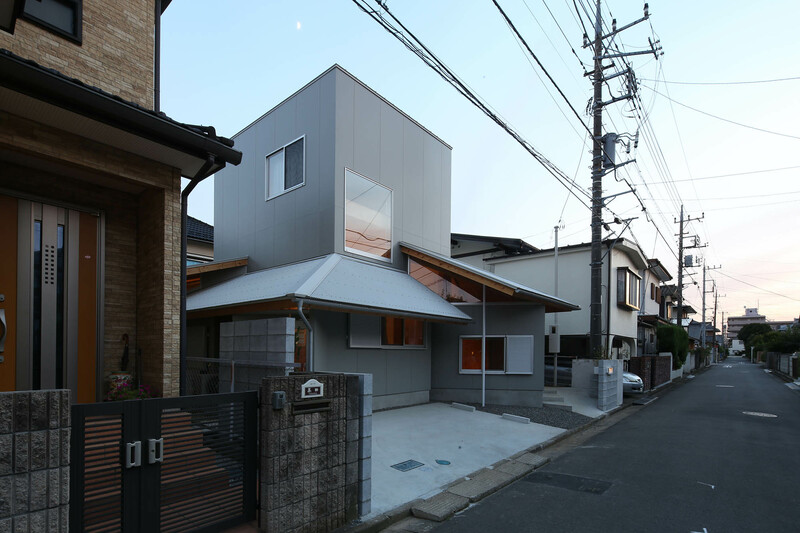 How ever these overpopulated conditions had functionalized the outdoor facilities, fostering over-the-wall communication among neighbors as both sides adjusted their levels of privacy within the tight exterior space between the house premises. Residents' demands for the exterior spaces have become increasingly diversified as well. For example, they want to throw out trash from the back door and grow herbs; enjoy the cool evening breeze in the garden facing the bathroom; aerate beddings from the bedroom with ease; and create a minimal, easy-to-manage garden in front of the living room. A detailed list of activities had become intertwined with various outdoor conditions such as having sunlight, allowing breeze through the berm, and securing privacy from neighbors. Within the long history of highly developed outdoor culture, we placed a small garden and living spaces situated around the perimeter of the house. 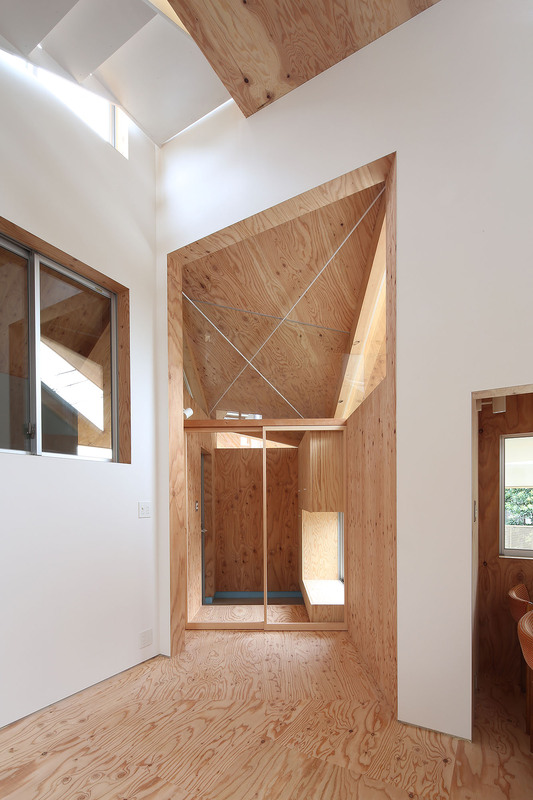 The pleated radial floor plan on the first floor is designed to capture the outdoor environment, foster a relationship with the small garden, and balance the levels of privacy from the neighboring houses. 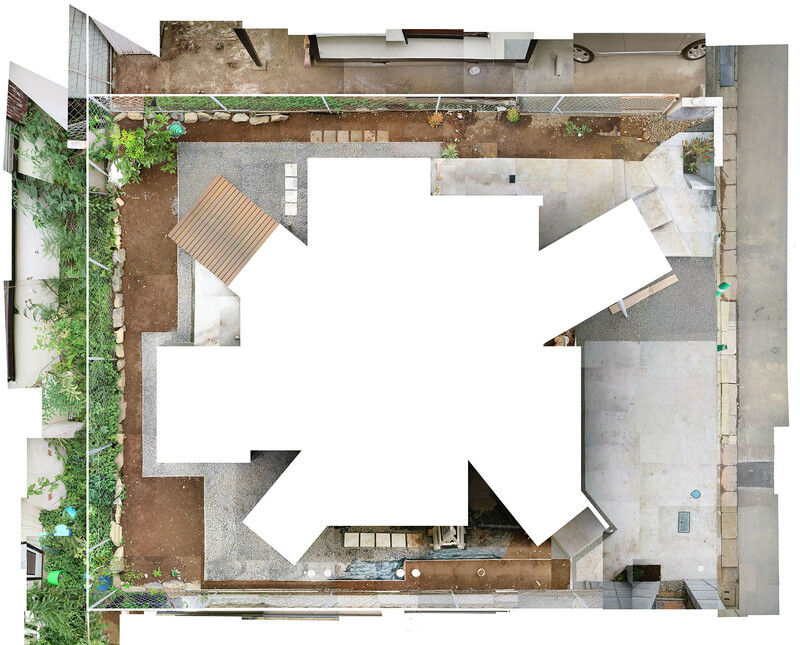 The small roof attached to the main house has been lowered to run in parallel to the site borders, following the shape of the berm and its spaces. 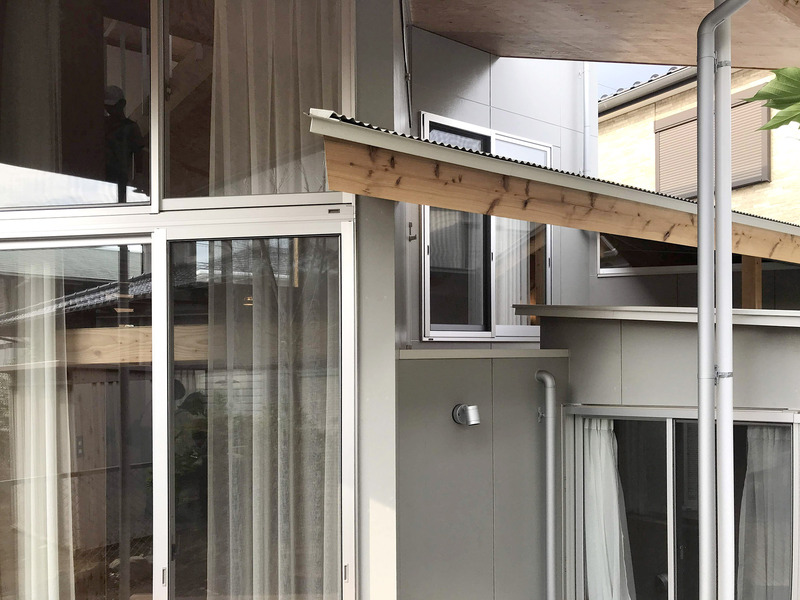 The imbalance caused by the first floor plan and the small roof of the geya gives rise to a variety of depths which, together with the pleated plan, balances the design from two different aspects. We decided to preserve the appearance of the area's quint essential house design characterized by the geya, while also making use of the unique community culture that had developed in the small gardens and berms. While the spaces and sections inside the pleated plan are designed to hold specific functions, they will evolve by adapting to different uses in the future. 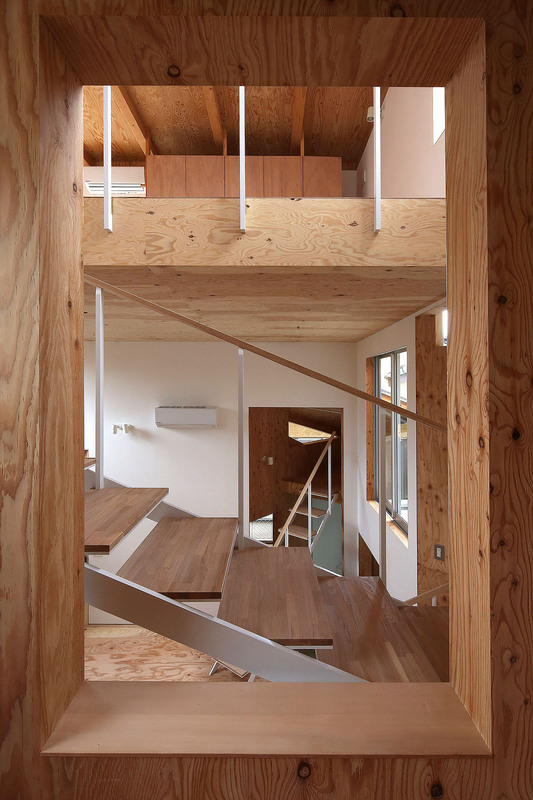 Since the house needs to accommodate for two families despite having limited floor space, each room is not equipped with enough capacity to be complete on its own. As a principle, no fixtures were installed between the geya and the main house; furniture such as the counter and table were placed so that they overflow from their designated areas. With ample sun light filtering through the windows, every corner of the house is designed to be filled with everyday activities. 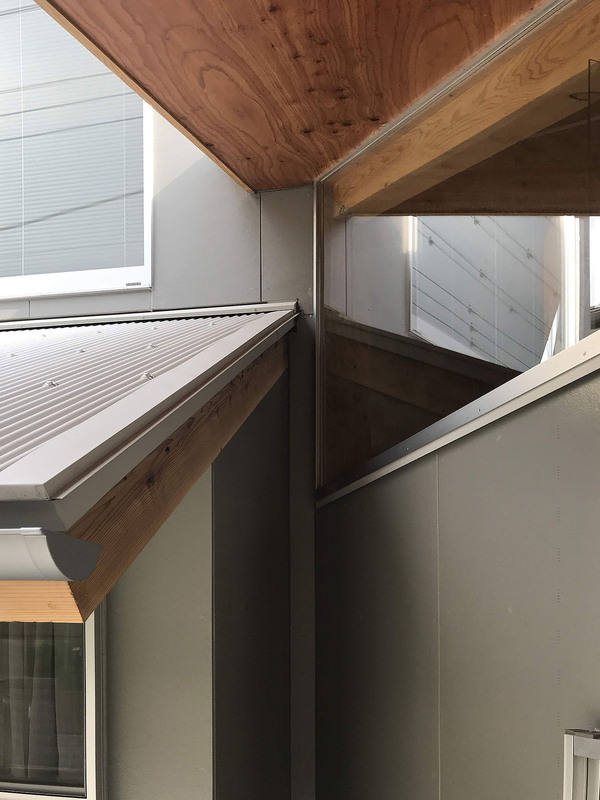 Geya, or rhe attached space underneath the small roof, becomes a comfortable spot near the window that can be used for the family to gather, and at times, to spend time separately. Looking into the series of small gardens from the berm, one can catch scenes from daily life continuously unfolding through the windows. 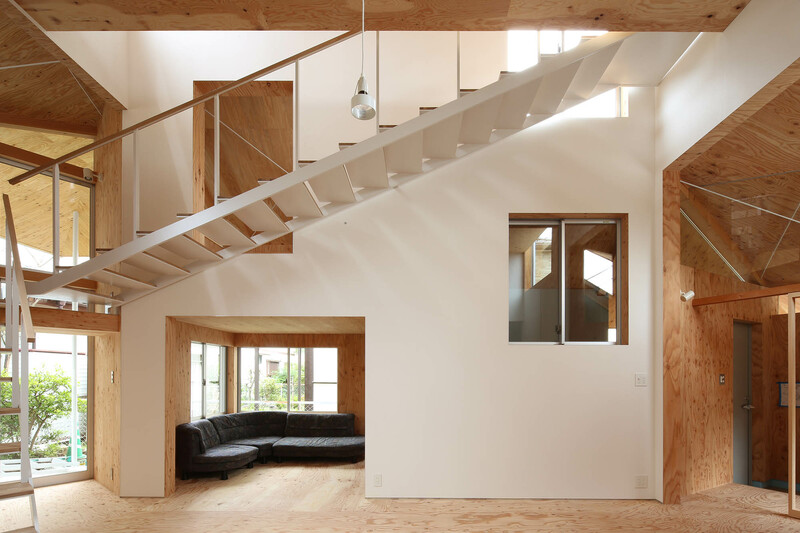 The house is also important in ways that are separate from daily life and comfort. 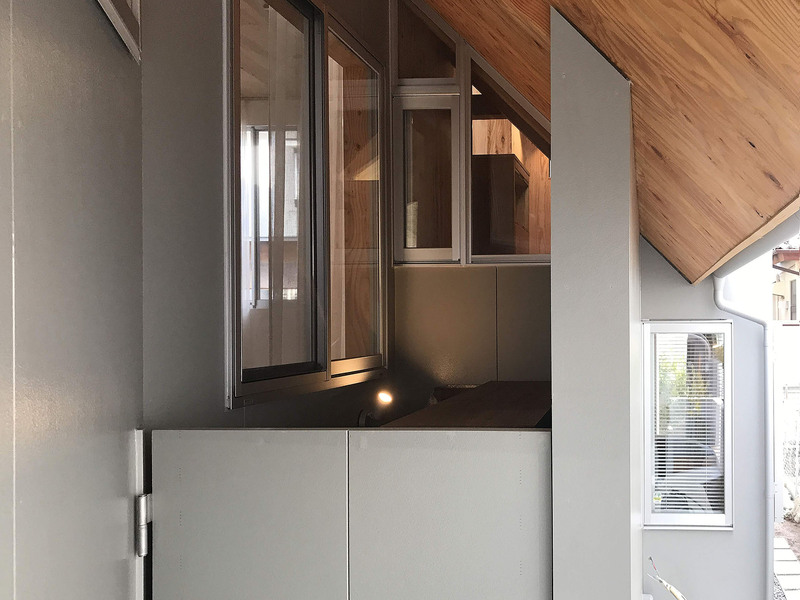 This new meaning is manifested in the center room that measures 4.5 x 5.5 meters with a ceiling that expands to 4 meters high; here, life unfolds against the window and over flows through all four corners. It is a closed space reserved only for the family members. The space is bright like the outside, and can adapt to different uses and changes that may occur in the future. Every family member will explore their own ways of living, taking hints from all corners of this house. 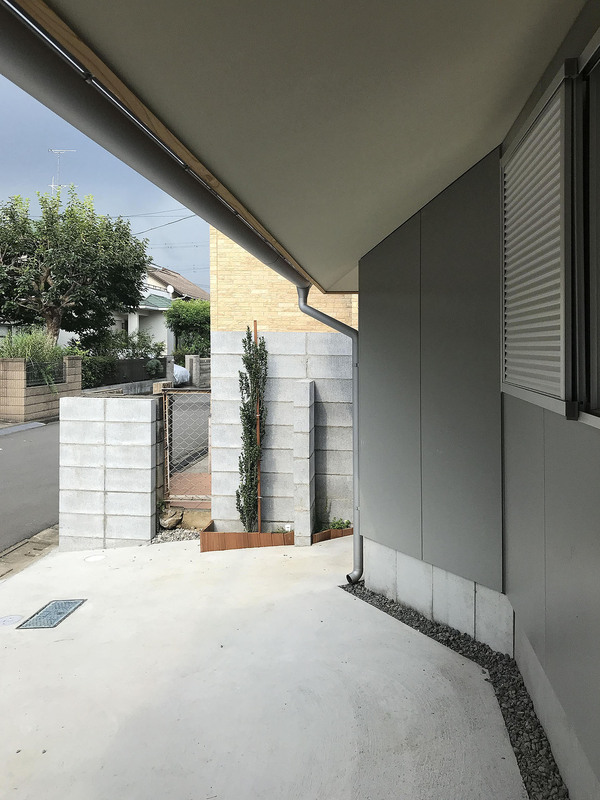 The home is like a courtyard where the extended eaves of the geya reduces brightness, creating a contrast with the middle space which takes on a flexible, outdoors quality. Usually, courtyard houses open up towards the court yard but remain closed from the outside. 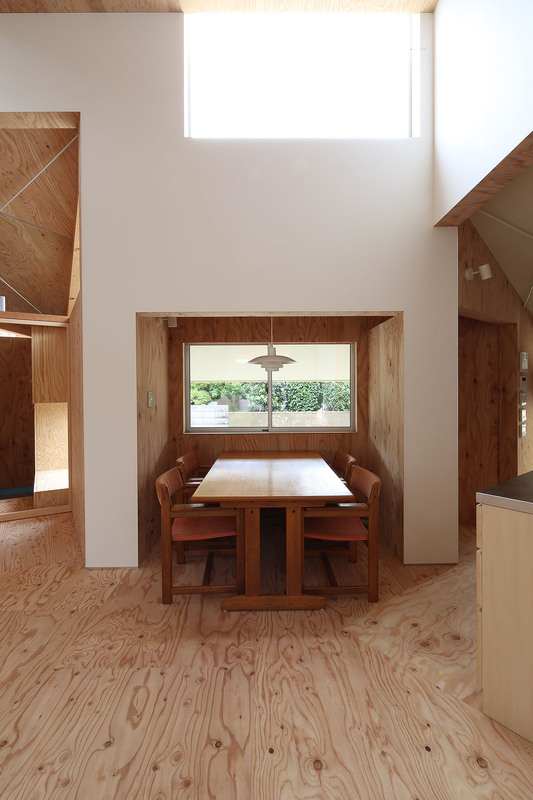 However, this house sensibly opens itself towards the berm to make sure it remains open and available to the neighbors, while making sure it remains comfortably private as a "closed home" where the family can live in peace. The tower-like appearance of the central room is evident in the main house exterior, serving as a familial icon for the family. By taking on the characteristic appearance of vernacular homes of this area, we hope that this house will grow to become an enduring part of this community.